On April 22, we’re calling on EVERYBODY to email EVERYBODY they know with a personal message about our Climate Crisis. We don’t want to provide an email template — because we want people to share their own views and emotions. But we will share the emails we are sending so that you can get an idea of how you might approach it. As you may or may not know, I’ve been getting more involved in climate organizing lately through Climate Pledge Collective and the Fridays for Future rallies. I never thought I would do this. And it is still uncomfortable for me. If you know me even a little, you know that protests, and generally broadcasting my views, is not something I do. I started out making personal changes like learning vegan recipes, we already preferred biking to driving, using LED lights, using reusable mugs, that kind of thing. But the more I read about the IPCC report, sought information on indigenous opposition to fossil fuels, and heard what young people all over the world are striking for, I began to understand how terribly all our systems will unravel in about 10.5 years (some estimates say this is a generous time frame). I began to see that we are actually already living through climate change effects – heat waves, forest fires, animal extinction, mass human deaths, increased lyme disease. Our other Co-Founder Matt, is aiming to reach out to the people who understand the problem but are putting off taking action because it seems too overwhelming. For Earth Day, I’ve decided to email everyone I know with a message about climate change, because it’s time we stopped pretending this crisis doesn’t exist. You probably don’t want to read an email about climate change. It’s not a pleasant topic. I understand. A year ago, I would close Facebook or switch off the radio at the first mention of climate or air travel or forest fires. I couldn’t bear it. The truth is though — and it took me a while to realize this — it wasn’t climate change itself that was causing my reaction. It was an internal dissonance, my own unease at the fact that I knew human civilization — our music, all of our children, our breath-taking cities, everything I loved — was at risk and I wasn’t doing anything about it. I wasn’t stepping up to fight for what I loved. And why not? It wasn’t because I was incapable — or even afraid — this isn’t a physical fight we’re talking about. I wasn’t doing anything just out of inertia, just because no one else around me was treating climate change like the emergency that it is, just because of an idiotic herd instinct. In first aid training, they call this the bystander effect. People are more likely to leap into action and save a life when they witness a dangerous situation on their own – or when they see someone else trying to help. When there is a crowd, we see other people failing to react and it paralyzes us all. And people who have been frozen by the bystander effect have to live with their inaction for years, wondering they were rooted to the ground in that one pivotal moment. But climate change is an ongoing emergency, we get a new chance to break the inertia and rewrite history every single day. Part of you wants to rise to the challenge, part of you knows there is more to life than just going through the motions of modern existence — but the rest of you is paralyzed, hypnotized by those same empty gestures. And so you look away, you put it out of mind, when you have free time, you try to distract yourself with netflix or a fancy restaurant. But whenever you look away, the itch gets worse and the next time you hear about climate change it bothers you more, you are frustrated with people who bring up an obvious truth, because they’re spoiling the illusion. But here’s the weird thing — and I can tell you this from experience — the moment you commit to fighting climate change with everything you’ve got, the fear goes away. Because it isn’t climate change that is particularly scary — all of us will die of something or other eventually — it is living a lie in the face of a historic challenge that is terrifying. 1. 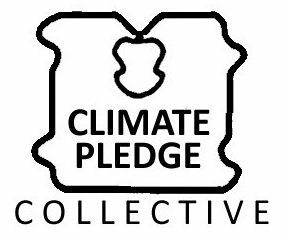 Complete our online pledge system which gives options for reducing your personal footprint and getting involved in collective action. 2. If you live in Toronto, sign this petition calling on city council to declare a climate emergency. 3. Commit to reading more climate news — sign up for an e-newsletter from The National Observer or follow climate organizations on social media. The more you read, the more real the problem will come — and the more you will understand that solutions are at hand. 4. Forward this email to everyone you know. It will seem awkward, but you should do it anyway, because that thin veneer of awkwardness is preventing us from talking about one of the greatest dangers in human history. This is just a low-dose of medication… you will need to develop your own regime depending on your responsibilities and capacities. If you have savings, you may want to take some time off work. I know a few people who have done this — and they seem so alive! The next two or three years may well be the most important years in all of human history. If you want to talk more about how you might get involved, I’ve been thinking about this 24/7. I don’t have a clear answer about what’s the ‘best’ approach, but I’m happy to share my thinking — send me an email and we can meet up or arrange a call. If you’re in Toronto, you can come out to Climate Picnic on May 5th to enjoy food and music and talk to climate organizers and local residents in a casual setting. Together we can rewrite the future! How will you phrase your letter? What action or actions will you suggest? Start drafting your emails today and get ready to hit ‘SEND’ on April 22. If you’re on Facebook, you can register for our event: https://www.facebook.com/events/448622085876182/. If not, just send those emails.